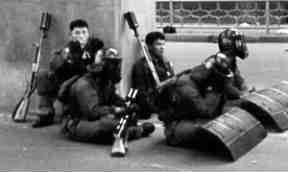 ..the riot police move in and battle the students using truncheons, CS grenades, and CS powder. 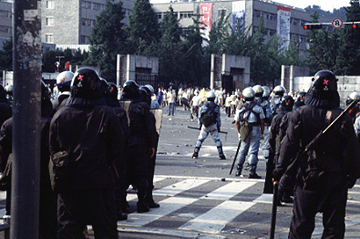 ..the students in the background taunt the riot police. During this particular confrontation, the two sides just stood and threw rocks and pieces of brick at one another. 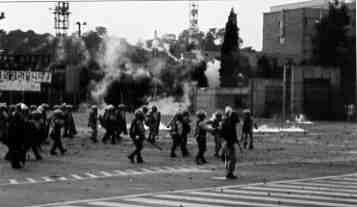 ..the riot police attempt to break into the front gate after firing off lots of CS gas. 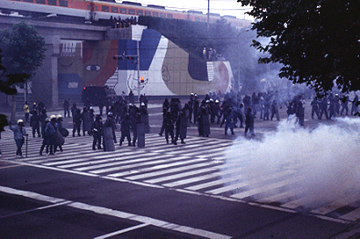 ..the students throw molotov cocktails at the riot police, surrounding them with pools of fire. ..taking a break a few hours later. The demonstration ended after about three weeks. One thing the traveller to Korea will notice almost immediately is the evident importance of national defense in this divided nation. 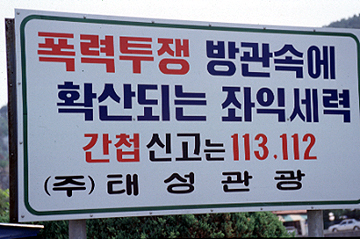 Signs just like this one are present all over South Korea, giving various warnings to the population about the threat from North Korea. The rhetoric of this particular sign alludes to the threat posed by those who demonstrate opposition to the southern government. Translated, it reads: If you just stand by and let violent demonstrations happen, then leftists will take over. If you have information on infiltrators or informants call 112 or 113. 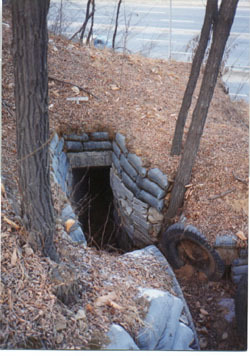 Infantry trenches and revetments like this one in Kupabal are commonly seen all over Korea, especially north of Seoul. ..this is the entrance to a reinforced machinegun nest that overlooks a road in Kupabal. 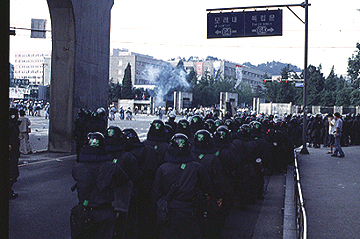 Infiltrators (from North Korea) actually are a reality in South Korea. 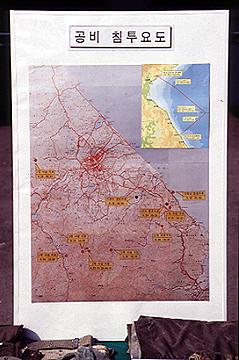 This map was part of a government exhibition at Seoul Station where the contents of the North Korean submarine that landed near Kangnung on the east coast in September, 1996 were displayed. 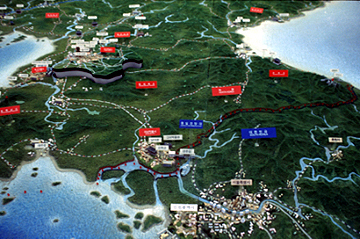 The map shows a section of the east coast where the sub landed, and shows red dots where the South Korean Army killed infiltrators as they tried to flee back into the North when their mission failed. 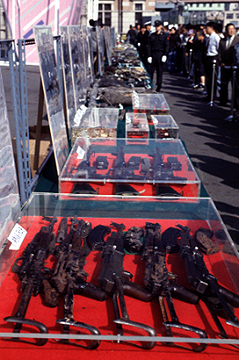 These AK-47s were supposedly found in the submarine, as well as other weapons, radios, cameras, southern military and civilian clothing, code books, etc. 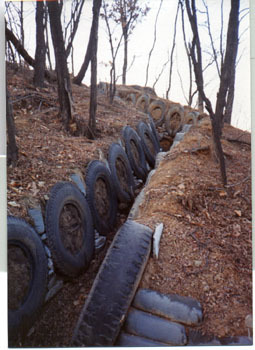 This is part of the 'security system' that protects sections of the east coast of South Korea. 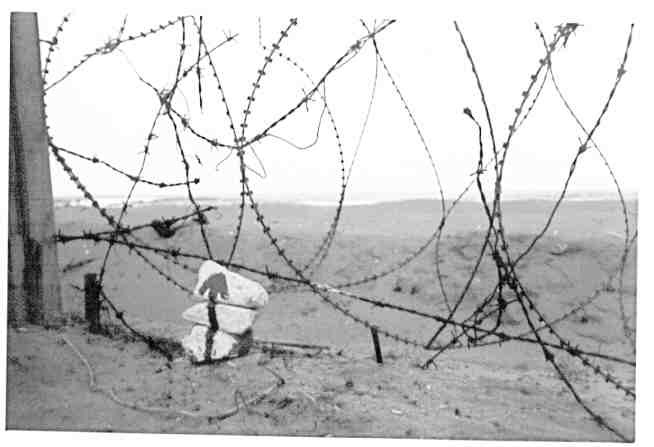 If infiltrators from the sea try to pass the barbed wire, they will knock down the stack of painted rocks. Soldiers passing by will see that the stones have fallen over, and the hunt will be on! It only goes to show that closely observing and defending hundreds of miles of coastline is next to impossible. 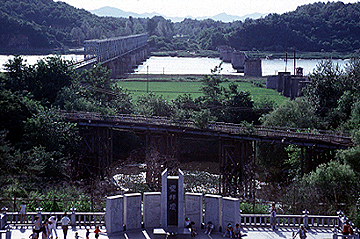 The blue-painted bridge on the left is the only link to the JSA, and is called 'freedom bridge'. The wooden bridge in the middle is where POWs were allowed to cross back into the South at the end of the war. 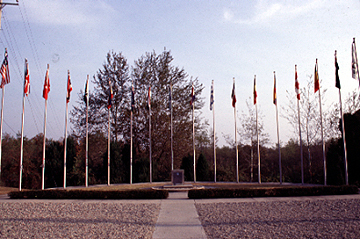 In the foreground is a memorial place for southern families who have relatives in the North. This is the furthest north that they can travel. At the JSA. 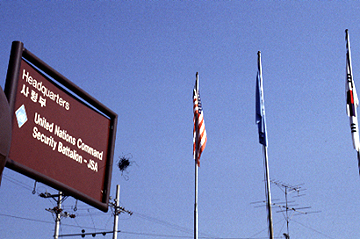 The southern side is staffed by both South Korean and U.S. soldiers. The 16 flags of the nations that fought on the side of the Republic of Korea during the war. This is 'Conference Row'. 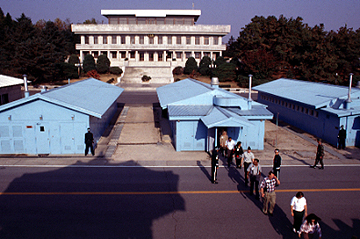 These blue and silver buildings are bisected by the actual Military Demarcation Line that separates the North and South. They are the places where the opposing militaries and governments meet. In the background is North Korea and the headquarters building for the North Korean Security Forces called 'Panmungak'. It also where Northern tour groups enter and exit to visit Conference Row. In the foreground, a tour group exits the Military Armistice Committee building in the South. ..a southern soldier stands on the south side of the buildings watching the northern soldiers' every movement. He's acting as security for the southern tour groups. He wears sunglasses so the northerners cannot see his eyes and what he is looking at. They also stand halfway behind the buildings in order to have some sort of cover in case someone on the North's side starts shooting. 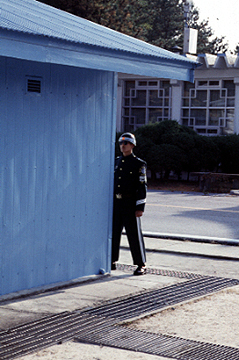 A southern soldier stands in the MAC building stradling the actual border, with his left foot in North Korea and his right foot in the South. 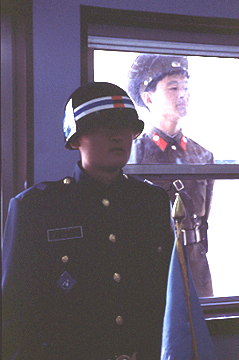 The soldier looking in is a North Korean standing on the northern side. The flag on the table is the U.N. flag. The North Koreans also used to have their flag here, until the summer of 1995 when the northern government declared the armistice a "worthless scrap of paper", and took their flag off the table.